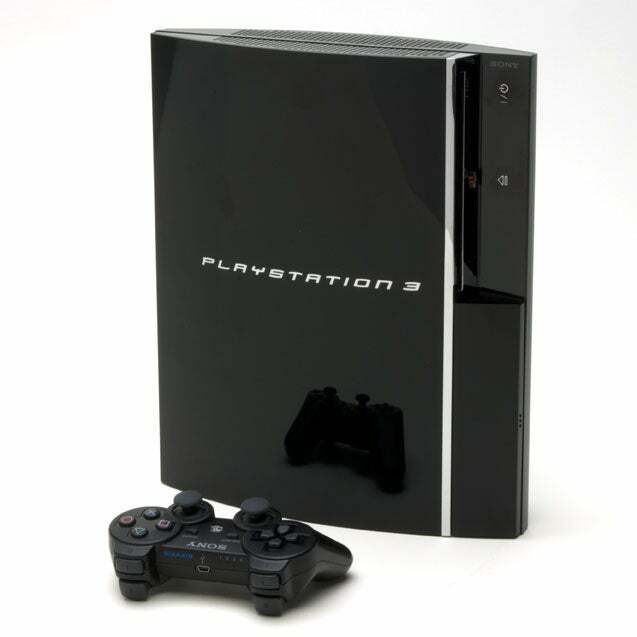 From the outset, Sony has considered the PlayStation 3 an all-around entertainment console, with tendrils that extend well beyond the realm of game play. Perhaps chief among these is its support for the Blu-ray Disc format, which lets you play high-definition movies. But can the PS3 perform competitively with stand-alone Blu-ray players from consumer electronics makers? The short answer is yes. In my initial hands-on tests, the PS3's Blu-ray Disc playback was very good--even better than I'd anticipated. (If you're impatient to read my first impressions of the PS3's image quality for Blu-ray Discs, skip ahead to "Sublime Video," past the interface discussion.) However, this is not an unqualified endorsement; in fact, I found several drawbacks that may give audio-visual enthusiasts pause. The PS3's movie playback experience is best if you start from scratch, inserting a disc into the front-loading slot as soon as you power up the unit. It took just 3 seconds for our Underworld Evolution disc to physically load into the unit itself, followed almost immediately by the PlayStation 3 startup music. The screen then blacked out, and the movie came up on screen. Total elapsed time from disc insertion to the start of the program (in this case, Sony Pictures Home Entertainment's opening splash screen) was a respectable 24 seconds. If you want to play a movie with the PS3 unit already on, the experience differs. You insert the disc and wait for something to happen, except nothing happens. The issue--one of several that keep the PS3 from being a killer Blu-ray Disc player--is that, if already turned on, the machine does not automatically start the movie disc. Furthermore, after detecting the presence of the BD-ROM, the PS3 doesn't automatically highlight that new video option so that you can select it, let alone properly identify the BD-ROM movie on the disc--as Black Hawk Down or The Phantom of the Opera, for example. Instead, the newly inserted BD-ROM appears as an option above the Video menu index (in contrast with the other video content that we had loaded on the PS3's hard drive, which appears below the Video menu listing). You have to manually select the BD-ROM by scrolling up to that spot, and then select it by pressing the X button on the controller. The movie disc is still not identified by name, only as a BD-ROM. Once I had the movie loaded, I discovered the next irksome hurdle to using the PS3 as a home entertainment console. Since it doesn't come with a separate remote control for video playback, I had to use the game controller to navigate through movies, and that required two hands. Two-handed navigation for entertainment players is not unheard of--several high-end remote controls from Harmony, Philips, and others require two hands--but it is unusual, and certainly a departure from the more commonplace and ergonomic single-handed clicker. I adapted to the PS3 controller, but ultimately, though elegant for game play, it proved kludgy as a BD remote. Using two hands to control basic functions like play, fast forward, and rewind was both ungainly and imprecise; I missed not having dedicated buttons for such common features. Nonetheless, even with the added cost of the remote, the high-end PS3 still costs significantly less than stand-alone BD players, which range in price from $899 for the Philips BDP9000 to $1500 for the forthcoming Pioneer Elite BDP-HD1. If you buy the high-end PS3 with the remote, you'll spend about $625 (the standard console costs $100 less), making the PS3 an attractive option for high-def movie playback. To navigate up, down, left, or right within the disc menus, you can use either the PS3 controller's directional pad or the left analog stick controller. You press X to select options and to activate play. The O button lets you exit the BD player, the square button brings up the disc's pop-up menu, and the triangle button gives you a handy, transparent-overlay on-screen menu that pops up on the left side of the screen. This menu provides quick access to certain settings, and awkward access to dedicated software-based playback controls (for example, buttons for fast forward, rewind, play, and stop)--which you need since the game controller lacks such dedicated controls. Trying to perform certain operations, such as precise fast-forwarding, was particularly frustrating. The fast-forward steps ahead at 1.5X, 10X, 30X, and 120X, and you must press the X button to cease moving forward. Stepping forward frame by frame is even more awkward: No option clearly exists for this, but you can press the controller's X button to pause playback and then use the analog stick or the right and left arrows on the directional pad to advance a frame at a time. Unfortunately, you'll have to experiment to figure all this out: The manual included with our PlayStation 3 provided no clues on how to use the controller's buttons for movie navigation. I had to dope out the responses via trial and error, and frequently found several paths to the same operation. This could be either confusing or convenient, depending on your perspective and on how comfortable you are using the controller to navigate the interface. In spite of these nits, the PS3's Blu-ray Disc movie player proved highly satisfactory in many ways. I popped multiple Blu-ray Disc movies into the player and found that I liked the relatively quick speed with which it loaded and navigated through discs. I encountered a few noticeable pauses while switching between far-flung chapters on a disc, but no interminable hourglasses or annoying waits like the ones I experienced with the Samsung BD-P1000. The PS3 can resume playback; I discovered, though, that if I exited the player app to do something else on the PS3 before reselecting the BD movie, there was an obvious lag before play started up again. I found the pop-up info display elegantly designed--unobtrusive, yet easily readable. (The easiest path to this display: Press the Select button in the middle of the controller.) It's a good thing that the display is a pleasure to read, because you'll be invoking it a lot: The pop-up is the only way to figure out where you are in the disc, since the PlayStation 3 console lacks an LCD screen such as those commonly found on DVD and dedicated Blu-ray Disc players. Personally, I prefer having an LCD on my player that I can glance at to see how many minutes remain, but the PS3's approach does have an advantage: In dark environments, you won't be distracted by a glowing LCD. The display shows plenty of information about a given disc. On the top row you see the audio codec, including how many channels of sound, the sample frequency in kHz, and the bit rate. Comparable information is displayed for video (the video codec and bit rate). The bottom row displays the disc's title number and chapter number, the time elapsed, and the total time, with a meter that shows where you currently are on the disc relative to the total playing time. While usability is critical to any consumer electronics device, the quality of the output remains paramount. Having the PS3 finally allowed me to compare the first-to-market Samsung BD-P1000 (with the original, factory-installed firmware) side by side with another Blu-ray Disc player, and the results highlighted a video-quality shortcoming in the original release of the Samsung player that shipped in the summer. Earlier, with no other Blu-ray player to compare against the Samsung, I had found its output of HD films on Blu-ray definitely better-looking than the same movies on standard-definition DVD. However, when I watched the same Blu-ray movies on the PlayStation 3, I could better appreciate Blu-ray's potential for image clarity. I also found the overall image quality more comparable to that of HD DVD films I've seen displayed on Toshiba's HD DVD players, in terms of sharpness, detail, and color. Though my first impressions of the PlayStation 3's Blu-ray video playback quality were positive, videophiles should take note: The PS3 has two technical limitations that set it apart from stand-alone Blu-ray players. First, unlike stand-alone Blu-ray players, the PS3 does not have a dedicated video chip set optimized for decoding Blu-ray video, instead relying on the Cell processor and its software to do the job. This may turn out to be a plus, however, as Sony's improvements to the player software can be more easily distributed to existing users than a hardware upgrade. Second, the PS3 offers 1080p60 (where the 60 refers to frames per second) playback, which is less optimal than 1080p24 for filmed content. Few displays support 1080p24 output today, but if your HD set and your BD player do so, you should see higher-quality images than you'd get from 1080p60 output. Since movies are filmed at 24 frames per second, you'd want to use an even multiple of 24 (such as 72 frames per second) to avoid motion artifacts in slow-panning scenes. If you display 24-fps content at an uneven multiple, like the commonly used 60 fps, you'll end up with those artifacts. The PS3's minimalist menu interface has some strong points, but the bare-bones approach can leave you scratching your head as you explore your audio and video output options. For example, if you bravely dig deep through the Settings menu into the BD/DVD Settings, you'll find an arcane option for Cinema Conversion, with choices of Automatic and Video but no on-screen explanation of what they mean. You have to turn to the online user manual for clarification. According to that manual, the setting optimizes playback to match the frame rate of your source video: The Video option is for 30-fps output, such as you'd find with TV shows and animated content encoded at 480i or 576i resolution. The Automatic option refers to movies, which are captured at 24 fps. The player will convert the video for output to your display depending on the setting you choose (the default setting is Automatic). The minutiae of the PS3's audio settings are even less clear. Neither of the two BD Audio Output format options--Linear PCM (the default) and Bitstream--is explained. I had to go to Sony directly to find out. The PS3's default is to convert recognized audio streams to Linear PCM, an uncompressed audio format, for output via HDMI or digital optical audio. This can be advantageous if, for example, you're outputting to an HDTV that has built-in speakers and decodes only Linear PCM. If you're using your own home theater receiver, though, you'll want to use the Bitstream setting: In this mode, the PS3 passes the audio "bitstream"--be it Dolby Digital, Dolby Digital Plus, Dolby TrueHD, DTS, or DTS-HD--through to your receiver via the HDMI or optical connector; from there, the receiver decodes the audio and outputs it to your speakers. If you go with the default and use HDMI for a source with 7.1-channel audio, you'll need to output to a device that can read Linear PCM at 7.1 channels to get the full benefit. If your disc has DTS-HD 7.1-channel audio, that audio will be output at 5.1 channels instead. If you choose the Linear PCM default but use the digital optical connection, you can have only 2- and 5.1-channel sound. The multi-A/V-out (either component or composite video) supports 2-channel audio only.